In spite of expected plenty of colourless draws and absolutely normal desire of many participants to play more safely at finish, the second half of the championship turned out to be very interesting. It so happened that mostly players who succeeded both in result and qualifying have become the heroes of the review. On the whole, a creative risk and a struggle for high result did not prevent each other. A delighting fact, of course. As in the previous part, all games have been gathered into sections, rather conditionally indeed. The classification has almost repeated itself. I hope the reader will not be disappointed. 1.d4 d5 2.c4 e6 3.¤c3 c6 4.e4 dxe4 5.¤xe4 Ґb4+ 6.Ґd2 Јxd4. Slav Gambit is rather popular nowadays. 9...Јxg2! Risky but liable and possibly the strongest continuation as Dusko Pavasovich proves by his practice. 10.Јd2. 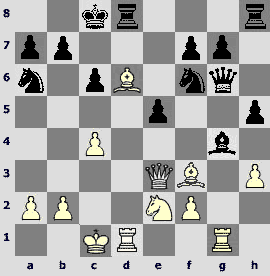 In Jobava – Potkin, Batumi 2002, White got the upper hand after 10.Јd4 ¤h6 11.O-O-O ¤f5 12.Јd2 ¤xd6?! 13.Ґf3 Јg6 14.Ґxc6+! 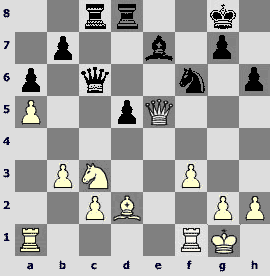 bxc6 15.Јxd6±, but it is not fully clear how to play after cold-blooded 12...Јxf2! 10...¤f6. 10...Јxh1? 11.O-O-O e5 (11...Јe4 12.Ґe7! f6 13.Ґh5+ќ) 12.Ґxe5 f6 13.Ґf3ќ is bad. 11.Ґf3 Јg6 12.O-O-O!?N. Only 12.¤e2 met earlier, but Pavasovic is ready to this turn also. 12...e5! (12...¤e4? 13.Ґxe4 Јxe4 14.Јg5ќ) 13.¤e2. Simple 13.Ґxe5!? is worth considering. 13...Ґg4! Black makes a series of seemingly risky but indeed accurate and verified moves to take over the initiative. 14.¦hg1 (14.Ґxg4 ¤xg4 15.f3 ¤f2µ) 14...O-O-O! 15.Јe3. On 15.h3 there exists a very perspective queen sacrifice 15...Ґxf3!? 16.¦xg6 hxg6 17.Јe3 ¦xh3© and computer-like 15...¤e8!? 16.Ґxg4+ f5 as the alternative, Black standing better in both cases. 15...h5! 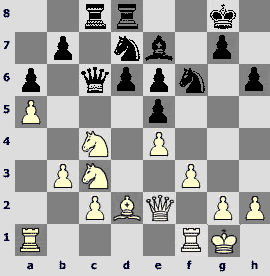 Reinforcing of the bishop on d4 prepares a stroke on d6. 16...¦xd6! The exchange sacrifice allows to mount the knight on b4. 17.¦xd6 ¤b4 18.Јb3 Јh6+ 19.ўd1 Ґxf3 20.Јxf3 Јh7. The queen is ready to jumps on c2. 21.¤c3 Јc2+ 22.ўe1 e4. Blacks attacks very purposefully. 23.Јf5+ ўb8 24.¦xg7! White's king has to make a dangerous voyage, but there is no another way. 27.ўg3! Just so. 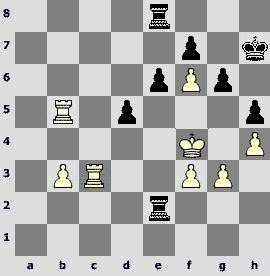 Surprisingly, in Alexander Moiseenko vs Pavasovic two rounds later White played 27.ўh2? here. After 27...¤g4+! 28.¦xg4 (28.hxg4? hxg4+ 29.¦h7 g3+! 30.ўxg3 ¦g8+°, or 29.ўg3 ¤h5+°) 28...hxg4 29.¦d1 ¦xh3+ 30.ўg1 ¤e2+! 31.ўf1 (all the same 31.ўg2 ¦h2+! 32.ўf1 ¤g3+ because 32.ўxh2?? is bad due to 32...Јh6+ checkmating) 31...¤g3+ 32.fxg3 ¦h1+ 33.ўg2 (33.ўe2 Јxb2+°) 33...¦xd1 34.¤xd1 Јxd1 35.Јe5+ ўc8 36.Јe8+ ўc7 37.Јxf7+ ўb6 Black gained an extra pawn in a queen endgame and won. 29.ўg5? After this mistake the fascinating game ends immediately. The only move is 29.ўe5! For example, 29...Јc5+ 30.¦d5 Јe7+ 31.ўf4 cxd5 32.Јe5+ Јxe5+ 33.ўxe5 with a sharp ending where white king's activity would compensate lack of a pawn. 1.e4 e5 2.¤f3 ¤c6 3.Ґb5 a6 4.Ґa4 ¤f6 5.O-O Ґe7 6.¦e1 b5 7.Ґb3 O-O 8.c3 d5 9.exd5 ¤xd5 10.¤xe5 ¤xe5 11.¦xe5 c6 12.¦e1 Ґd6 13.g3 Ґf5. It is not the very actual but very interesting line of Marshall Counter-attack. 18.Ґc2. 18.Јd1 leads to move repeating, and on 18.Јc1 Black may choose of 18...h5 (Leko – Anand, Cap d'Agde 2003) and 18...¦e6 (Shabalov – Aronian, Calvia 2004) with a good compensation for the sacrificed pawn. 18...Ґxc2 19.Јxc2 f5 20.c4. The alternative could be 20.¤f3!? f4 21.¤g5!, not tried yet. 20...bxc4!N. An important improvement as compared with recent 20...¤f6?! (Iordachescu – Brunello, Reggio Emilia 2007). 21.¤xc4 f4 22.Ґd2. 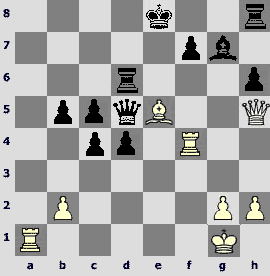 The variation 22.¤xd6 fxe3 23.¤xe8 exf2+ 24.Јxf2 ¦xf2 25.ўxf2 ¤e7µ is in favour of Black. White seems to have time to transfer his queen to f1, but it is not the case. 24.¦xe2 Јh3! 25.¤e3? Only giving up the queen allowed to keep struggling: 25.Јxf3! ¦xf3 26.¤xd6 ¤f6! with the eventual ¤g4. 17...¦a7. After 17...dxc3 18.Ґxb7 cxb2 19.¦a3 ¦a7 20.Ґc6 Black's position looks alarming. Maybe 17...Ґxf3!? 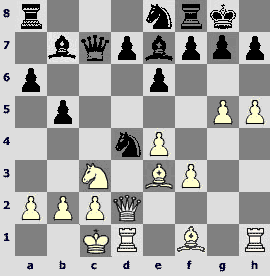 18.Јxf3 ¤xe5 19.¦ae1 Јxd6 20.Јxa8+ ўd7 21.Јb7+ Јc7 22.Јd5+ ўe7 is reasonable, but stronger is 19.Јd5! dxc3 20. 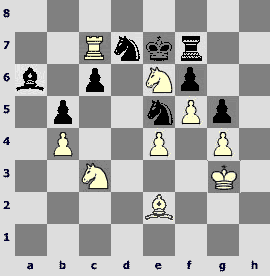 ¦ae1 (V.Belov, www.russiachess.org), complications being in favour of White. 18.Ґxb7 ¦xb7 19.¤e4. 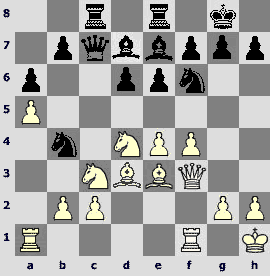 Black's king stuck to the centre and it is very difficult to defend. 19...¤xe5 20.axb5 axb5?! 20...¦xb5, still not opening the a-file, is more accurate though White has a strong attack all the same. 21.f4! Artem Iljin does not let the opponent to take breath. 26.¦xf7! 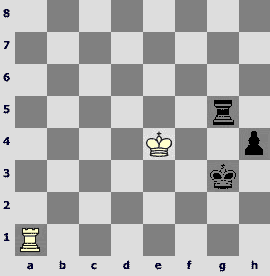 An elegant checkmating for completion. Exchanging dark-squared bishops first, Dmitry Jakovenko starts a resolute storm. 28.f5! Weakness of the point e5 is not principal here. 28...exf5. If 28...¤e5? then 29.f6 ўh8 30.Јh6 ¦g8 31.¤d5! exd5 32.¦c3 Јd7 33.¦f5! with inevitable checkmate. 29.exf5 ¦e5. 29...Јd8? 30.fxg6 hxg6 31.¦xf7! ўxf7 32.Јh7+ ўf6 (32...ўe6 33.Ґg4+ ўe5 34.Ґxd7ќ; 32...ўf8 33.¦f1+ ¤f6 34.Јxg6 ¦e6 35.Ґg4ќ) 33.¦f1+ ўe5 34.Јh6! g5 35.Јh3!ќ loses, and in case of 29...¤e5 30.f6 ўh8 (30...h5? 31.Ґxh5!) the position may be strengthened by 31.¦cd1!? and then, for instance, 31...b5 32.¦d4 g5 33.Ґd1! bxc4 34.Ґc2 ¤g6 (34...¤d3? 35.¦xd3! cxd3 36.Ґxd3ќ) 35.Јh6 ¦g8 36.¦g4± there is no envy of Black. 30.Ґg4! ¦d8?! Allows the final combination. 30...Ґc6 is more persistent. Now 31.fxg6 hxg6 32.¦xf7 ўxf7 33.Јh7+ ўe8 gives perpetual check only. But stronger is 31.a4! 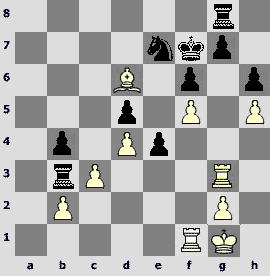 with the idea 32.b5 – it is unreal for Black to escape. 34.¦xf7! This nice-looking stroke has been being in agenda already. 1.¤f3 ¤f6 2.c4 c5 3.¤c3 d5 4.cxd5 ¤xd5 5.d4 e6 6.e3 cxd4 7.exd4 Ґe7 8.Ґd3 b6 9.O-O Ґb7 10.¤e5 O-O. 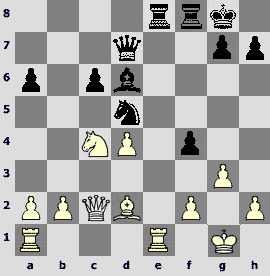 A typical position with an isolated pawn most often arising in Queen's Indian. 13...¤xd4!?N. A positional sacrifice. Before this game only 13...¦e8 met. 14.Ґxf8 Ґxf8 15.¤xd5. 15.¤xf7 ўxf7 16.Јxh7+ Ґg7 17.Јxg6+ ўf8› leads to a non-standard play. Possibly, 15.Ґe4!? was preferable. 15...Јxd5. 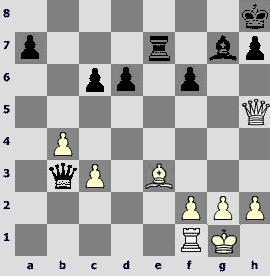 For the exchange Black got a pawn and two active bishops. White must be on the alert. 16.¦fe1 Ґb4! 17.Ґe4. Black is optimistic about coming forced variations. 17.¦e3 and 17.¤g4 was worth attention. 19...¤e2+! 20.ўh1. Maybe White was going to play 20.ўf1? but did not take into account unexpected 20...Јb5! 21.ўxe1 (21.Јg4 ¤d4+ 22.ўg1 Ґxf2+ 23.ўh1 Јxb2) 21...¤d4! 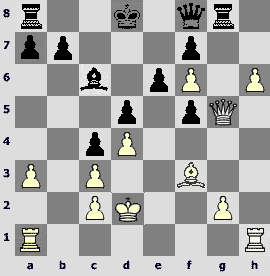 22.Јg4 (no other way) 22...Јxb2!, now 23.¦d1 losing because of 23...Јb4+! 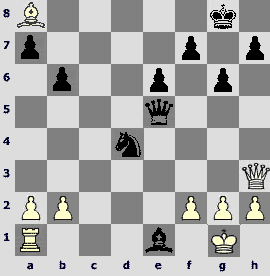 24.ўf1 Јc4+ winning the queen. 20...Ґxf2 21.¦f1? Missing a strong answer. 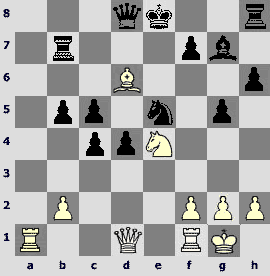 White should play 21.Јf3 Ґh4 22.g3, and now Black might pour oil on the flames by 22...Ґxg3!?. I think, chances are nearly equal. 21...Ґg3! White cannot capture the bishop and Black threatens with 22...Ґxh2! 23.Јxh2 ¤g3+ 24.ўg1 Јe3+ checkmating. 22.Ґf3 (22.hxg3? ¤xg3+ 23.ўg1 Јd4+! 24.¦f2 ¤e2+°) 22...Ґxh2 23.Ґxe2 Јxe2 24.Јf3 Јxf3 25.¦xf3 Ґd6. Black has three pawns for exchange already, and Arkadij Naiditsch accurately realizes his advantage. 1.e4 c5 2.¤f3 g6 3.d4 cxd4 4.Јxd4!? The most of principle reaction to 2...g6. 4...¤f6 5.e5 ¤c6 6.Јa4 ¤d5 7.Јe4 ¤db4 8.Ґb5 Јa5 9.¤c3 Ґg7 10.O-O O-O 11.a3 d5 12.exd6 Ґf5 13.Јh4 exd6N. Black declines 13...¤xc2 14.Ґxc6 exd6 (Jasnikowski – Honfi, Eksjo 1980) which could be followed by 15.Ґxb7 ¦ab8 (or 15...¤xa1 16.Ґxa8 ¦xa8 17.Ґh6) 16.b4! Јd8 17.Ґg5 Јd7 18.¤d5! ¦xb7 19.¤e7+ ўh8 20.Ґf6 with a dangerous attack. 14.axb4! A positional exchange sacrifice. 14...Јxa1 15.¤d5. While the black queen is out of play, White creates threats on the kingside end forces the opponent to spoil his pawn structure. 15...f6. If 15...¦fe8 then 16.¤f6+ Ґxf6 17.Јxf6 ¦e6 18.Јc3±. 16.Ґxc6 bxc6 17.¤e7+ ўh8 18.¤xf5 gxf5 19.¤d4. The weak pawns are the targets. White is not hasty to capture on f5 choosing the most suitable moment. 19...Јa4 20.c3. Fainthearted 20.¤xf5 Јxc2 21.¤xg7 ўxg7 22.Ґh6+ regaining material balance could not suite Sutovsky. 20...¦f7?! 20...a5 seems more useful; the numerous pawn islets ruined Black later on. 21.Јh5 Јa2 22.b3!? ¦e7 23.Ґe3. In order to not to take into account 23.¤xf5 Јe2. 23...¦ae8?! Now Black would have to return the exchange. 23...f4!? 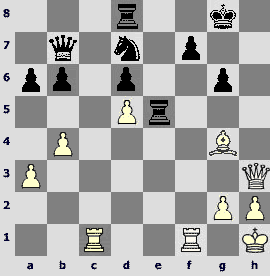 24.Ґxf4 ¦ae8 puts more problems for White. 26.Јa5! The queen is transferred to the opposite flank to press on a7 and c6. 26...¦e8 27.Ґd4. 27.Јxa7 Јxc3 28.Јd7 ¦b8 is weaker. 27...Јf7 28.Јa6 Јd7 29.¦d1 f5. Black hopes for chances in major-piece ending. 30.Ґxg7+ ўxg7 31.h3 ¦e6 32.Јd3 d5 33.c4! ¦d6 34.Јd4+ ўg8 35.¦d3! Rank 3 is an ideal place for the rook. 35...Јf7 36.Јc5 Јd7 37.Јd4 Јf7 38.¦a3. Black cannot defend all weaknesses, and now positional advantage transforms to material one. 38...Јg7 39.Јf4!? Possibly, 39.Јxg7+ ўxg7 40.¦xa7+ was also winning, but stones under water are often met in rook endgames. 39...Јd7. If 39...¦g6 then 40.Јb8+ Јf8 41.Јxf8+ ўxf8 42.cxd5 cxd5 43.¦xa7ќ. 41.¦xa7! Јxa7 42.Јxd6. The queen ending is won easily. 23.Ґxb5! A supplement to a collection of 'setting free a square' combinations. 23...axb5?! 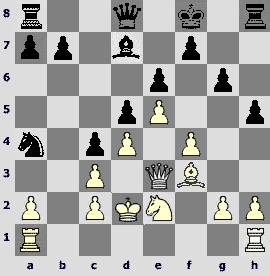 Black seemed not wishing to play lacking a pawn, otherwise he would choose 23...¦f7. 24.Јg2+ ўf7. The main line is 24...ўh8 25.¦xh7+! ўxh7 26.¦d3! with inevitable checkmate. 25.¦xh7+ ўe8 26.Јg7. The following is simple. 19...d5! The breakthrough in the centre seems impossible because of the suspended pawn on e5, but Valerij calculated everything clearly. 20.exd5. 20.¤b2 Ґc5+ 21.ўh1 Ґd4 is also sad-looking. 20...exd5 21.¤xe5. 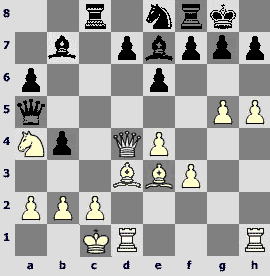 In case of 21.¤e3 d4 (21...Ґc5 is good too) 22.¤f5 Јe6 23.¤xe7+ Јxe7 24.¤e4 ¦xc2 White loses a pawn. 22...¦e8! A quiet move of destructive strength. White cannot avoid large material losses. 22...Ґb4? is weaker in view of 23.¤e4. 23.Јf4 Ґc5+ 24.ўh1 Ґd6! The bishop goes to e5 and all becomes clear. 18.f5! 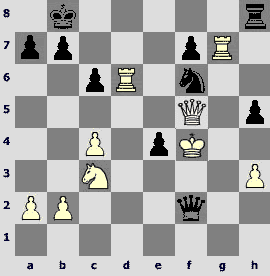 Black carelessly withdrew the defence of the pawn on d5 and White breaks through in the most fortified point. 18...gxf5 19.h4! Fixing the pawn on h5 in order to surround and eliminate it then. 19...Јe7 20.a3! One should not forget about prophylaxy. 20...ўe8 21.¤f4 ўd8 22.¤xh5 Ґc6 23.¤f6. White has strategically winning position. 23...¤b6?! To bear the knight on f6 is unpleasant, of course, yet Black must search for practical chances in counterplay on the queenside only. 24.h5 ¤d7 25.Јg5 ¤xf6 26.exf6 Јf8. No better is 26...Јd7 27.h6 ўc7 28.h7 ¦af8 29.Јf4+ ўc8 30.¦ag1 and then g2-g4. 28...ўd7 (28...¦xg7 29.fxg7 Јg8 30.h7ќ) 29.Јxf8 ¦gxf8 30.¦ae1. After queen exchange Black is fully helpless. 14.Јxd4!?N. 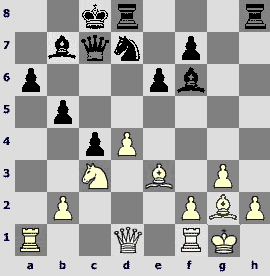 Another capture had been preferred in Gelfand – Karpov, Tallinn 2005. 14...b4 15.¤a4 ¦c8 16.Ґd3 Јa5?! White purposefully play to occupy the point b6. Black might try to distract him from the basic plan by 16...e5!? 17.Јa7 (17.Јb6 f5!?) 17...¤d6 18.¤b6 ¤b5! 19.¤xc8 ¦xc8 20.Јb6 Ґxg5!› with a complicated play. 17.Јb6! Јxa4. 17...Јxb6 18.¤xb6 ¦c7 19.Ґe2± leads to a difficult ending. 18.Јxb7 ¤c7. It seems, more chances gives 18...¤d6!, and on 19.Јxa6 not 19...¦xc2+?! 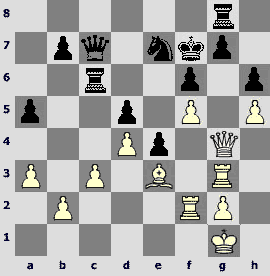 20.ўb1 Јxa6 21.Ґxa6, but 19...Јxa6 20.Ґxa6 ¦a8, though the bishop pair ensure White's advantage in this case also. 19.Ґc4 Јa5? 19...¦fd8 is more persistent. 20.¦xd7 Ґxg5 21.f4 Ґh6 22.ўb1 ¤d5. This tactical trick cannot change the outcome. 25.e7! The passed pawn cannot be detained. 1.d4 d5 2.c4 c6 3.¤f3 ¤f6 4.¤c3 e6 5.Ґg5 dxc4 6.e4 b5 7.e5 h6 8.Ґh4 g5 9.¤xg5 hxg5 10.Ґxg5 Ґe7. 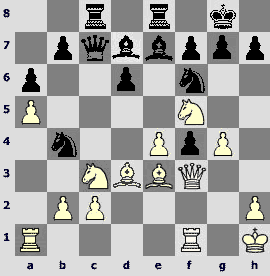 A rare variation in Botvinnik System. 15.a4!N. 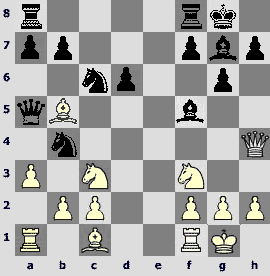 Alexander Beliavsky makes his opponent's opening choice doubtful. 15...a6. 15...b4, of course, would be followed by 16.¤e4 with further 16...0-0-0 17.Јf3 or 16...c5 17.Ґf4. 16.O-O O-O-O?! Is met by nice refute. It was better to leave the king in the centre. 20.Јa1! An important resource. White unpins and co-ordinate his pieces on the side file. 20...¤b3. There is no choice: 20...Ґxd4 21.Ґxd4 ¦xd4 22.Ґxb7+ ¤xb7 23.¦a8+ќ; 20...¦xd4 21.Ґxd4 Ґxd4 22.Ґxb7+ ¤xb7 23.¦a8+ ўd7 24.¦d1ќ. 21.Ґxb7+ Јxb7 22.¦xb7 ¤xa1. 22...ўxb7 23.Јb1 is not better. 23.¦xf7 ¤b3 24.¦xf6. A realization of the extra material is not difficult. 1.¤f3 ¤f6 2.c4 g6 3.g3 Ґg7 4.Ґg2 d5 5.cxd5 ¤xd5 6.d4 ¤b6 7.¤c3 ¤c6 8.e3 O-O 9.O-O ¦e8 10.¦e1 e5 11.d5 ¤a5 12.e4 c6 13.b3!? 13.Ґg5 is of more common use. 13...cxd5 14.exd5 Ґg4N. A novelty. Only the immediate 14...e4 met earlier. 15.Ґa3 e4. We shall see that further simplifications would not permit Black to equalize fully. A finishing to develop queenside by 15...¦c8!? was worth attention. 16.¤xe4 Јxd5. 16...Ґxa1? 17.Јxa1 ¤d7 (17...¤xd5 18.¤e5 Ґe6 19.¤d6 ¦e7 20.¦d1) 18.¤fg5 is too risky, and if 16...¤xd5 then 17.¦c1 with the initiative. 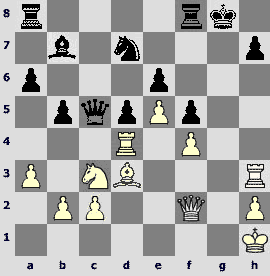 19.¤d6!White pieces are much more active. 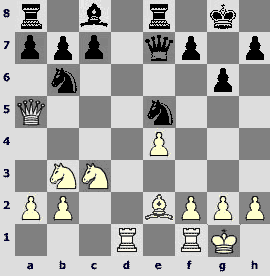 The powerful knight on d6 aims at the pawns on b7 and f7. 19...¦xe1+ 20.¦xe1 ¤db4. 20...Ґf8 would be followed by 21.¤g5. 21.Ґxb4 ¤xb4 22.¤g5! Now the positional advantage turns into the material one. 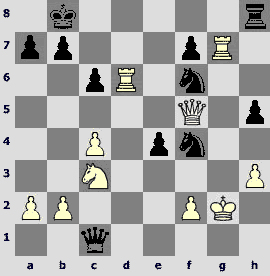 24.¤gf7?An inaccuracy, giving a real chance to Black to escape. 24.¦e4!± is stronger. 24...¤xa2 25.¦e7 Ґf8? A returned miss. 25...ўf8 would allow to avoid the following tactical operation and not to bother about the future. 26.¤h6+! 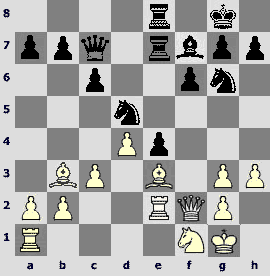 To capture the knight is bad, so White can rearrange his pieces ideally. 26...ўh8. If 26...Ґxh6 then 27.Ґd5+ ўh8 (27...ўf8 28.¦f7+) 28.¤f7+ ўg7 29.¤e5+ ўh8 30.¤xg4. 27.¤df7+ ўg7 28.¦c7 Ґe6 29.¤g5+ ўxh6 30.¤xe6. 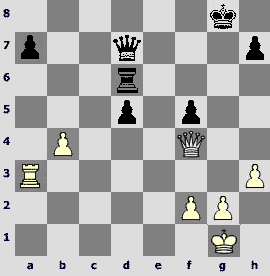 White dominates in spite of the restricted material. 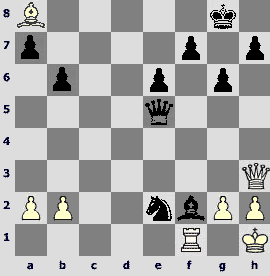 Moreover, Black's king gradually sinks into the checkmating network. 30...Ґd6?! 30...¦e8 31.¤xf8 ¦xf8 32.Ґd5 ¤b4 looks more viable. 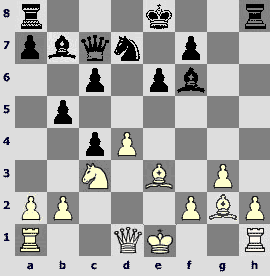 After the text move White launches a decisive attack. 32.h4! Ґa3 33.g4! White threatens with 34.g5+ checkmating. 33...Ґc1. On 33...g5 would follow 34.h5 and then the knight transfers to f5. 34.ўf1. Taking away the square e2. The main idea is to play f2-f4 and then Ґf3 or even ¤g5! 34...¦e8 35.¤d8! Another misfortune – a check from f7. 1.e4 c5 2.¤f3 d6 3.d4 cxd4 4.¤xd4 ¤f6 5.¤c3 a6 6.Ґe2 e6 7.a4 ¤c6 8.Ґe3 Ґe7 9.O-O O-O 10.f4 Јc7 11.ўh1 ¦e8 12.Ґd3 ¤b4 13.a5 Ґd7 14.Јe1 ¦ac8 15.Јg3 ¤h5. 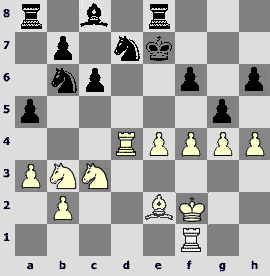 A reliable method to push White's queen off its active position. 17.g4!? Dmitry Jakovenko is in aggressive mood. 17...e5?!N. I doubt it was good to refuse of standard 17...Ґc6 18.g5 ¤d7, Smirin – Cvitan, Zagreb 1993. 18.¤f5 exf4? The game did not begin actually but Black makes a fatal mistake already. The knight on f6 needed care. Although, after 18...Ґxf5 19.gxf5 ¤d7 you can notice some achievements of White. 19.Ґb6! Could this simple intermediate move have been unexpected for Andrei Volokitin? 19...Јc6 20.g5. Black cannot avoid material losses. 20...¤xe4?! In case of 20...Ґxf5 21.gxf6 Ґxf6 22.exf5 could seize several pawns for a piece but hardly could have changed the outcome. 21.Ґxe4 d5 22.¤xd5 Ґxg5 23.¤c3 ¦xe4 24.¤xe4 Јg6 25.¤xg5 Јxg5 26.¤d4. White has merely an extra rook. 77...h3! The only way to win. 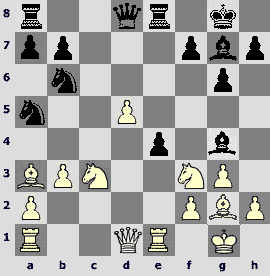 Black uses the unhappy position of the white king. The line 77...¦b5 78.¦a3+ ўg4 79.ўe3 ¦f5 (79...¦b2 80.¦a8=; 79...h3 80.ўf2=) 80.¦a8 h3 81.¦g8+ ўh4 82.¦h8+ ўg3 83.¦g8+ ўh2 84.ўe2= leads only to a draw. 78.¦g1+ ўh4 79.¦h1. If 79.¦xg5 then 79...h2!°, and the pawn promotes with check. 79...¦g2. White has nothing to oppose to the gradual advancing of the pawn. 80.ўf3 ¦a2 81.¦b1 h2 82.¦c1 ўh3. 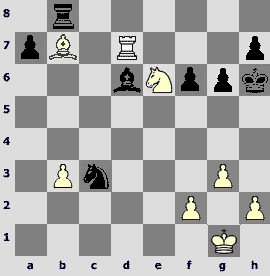 The black rook will inevitably pass to the f-file, so White resigned. 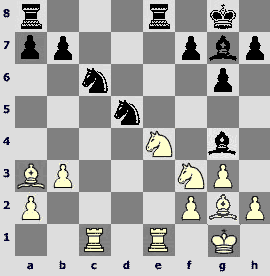 A mistake made by Artyom Timofeev in the four-rook ending led to an unexpected outcome. 44.¦c7? 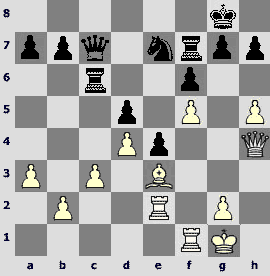 After 44.¦b7 or 44.g4 the position is nearly equal. 44...g5+! 45.ўxg5. 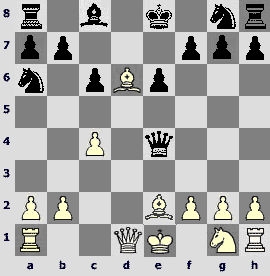 In case of 45.hxg5 ўg6 46.g4 h4 White's king is in the trap. Two games of Konstantin Sakaev won 'to order' at the very finish I liked most of all creations of Petersburg chesplayers. There is 'iron logic' in them, fine style and influence of chess classic. 10...Ґc7N 11.¤f1 ¦e8 12.¤g3 Ґg6 13.Ґg5 f6 14.Ґe3 Ґf7 15.c3 ¤f8 16.d4. 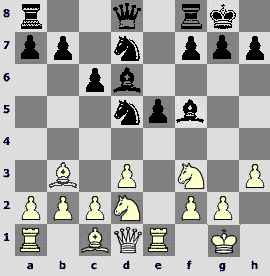 In the nearly equal position White decides to change the pawn structure in the centre. 16...e4 17.¤d2 Ґxg3 18.fxg3 Јc7. Black created a passed pawn, which will become defended soon. 22...¤b6!? An interesting method. The knight makes a shuttle manoeuvre permitting to reveal weaknesses in the opposite camp. 23.g4 ¤d5 24.Ґxd5. 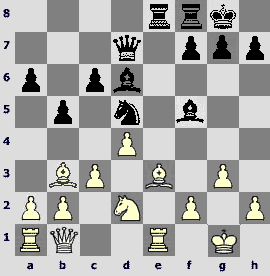 The weakness of f4 forces this decision of White. 24...cxd5 25.¤g3 ¦e6 26.¤f5 ¦c6. Black's position is slightly preferable already. 27.¦f1 Ґe6 28.a3 ¦f8 29.h4 ¦f7 30.h5 ¤e7 31.Јh4? A positional mistake. 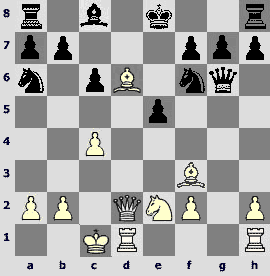 White should try to get opposite-colour bishops by 31.h6 g6 32.¤xe7+ Јxe7 33.Јg3 with an acceptable play. 32...h6!Fixing pawns on the kingside and preventing White's counterplay. On the opposite side Black is preparing a classic 'pawn minority attack'. 33.¦f4?! Not feeling the danger. 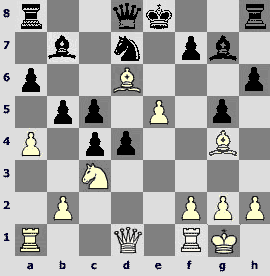 Better is 33.Јg4 depriving Black of possibility to change places of his king and rook on f7. 33...¦f8 34.¦ef2 ўf7! The peculiar 'castling' precedes pawn offensive on the queenside. 37...Јc8! The pawn on f5 is a headache for White. 38.ўh2 ¦b6 39.Јf4 ¦b3! An original idea. 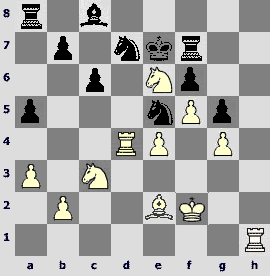 Before bringing into motion his b-pawn, Konstantin Sakaev pushes forward his rook. 40.Ґc1 b5 41.¦f1 Јc4 42.ўg1 b4 43.axb4 axb4 44.Јd6 Јc6! 45.Ґf4. After 45.Јxc6 ¤xc6 the pawn on d4 suspends. 46...¤xf5! Forcing transition to a winning rook ending. 47.¦xf5 ўe6 48.¦f1 ўxd6 49.¦xf6+ gxf6 50.¦xg8 ¦xb2 51.cxb4 ўe6 52.g4 (52.b5 ўf5°) 52...¦xb4 53.¦g6 ¦xd4. Tied passed pawns in the centre decide the game. 1.d4 ¤f6 2.c4 g6 3.¤c3 d5 4.Јb3 dxc4 5.Јxc4 Ґg7 6.e4 O-O 7.Ґe2 ¤fd7 8.Ґe3 ¤b6 9.Јc5. White opts for a poisonous though seemingly harmless scheme against Gruenfeld Defence. 9...e5 10.¤f3 exd4 11.Ґxd4 Ґxd4 12.¤xd4 ¤8d7 13.Јa5 Јe7N. 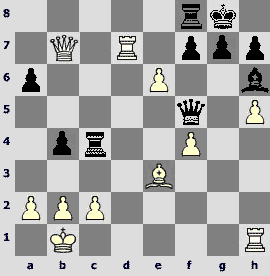 In Yakovich – Ernst, Goteborg 2002, where 13...Јf6 met, White had some advantage too. 14.O-O ¦d8 15.¦ad1 ¤e5 16.¤b3. Preventing 16...¦xd4 17.Јxd4 ¤c6 and preparing the next move. 16...¦e8. 16...¤ec4? is bad because of 17.Ґxc4 ¤xc4 18.¤d5! 17.Јc5! White must get rid of the queens to use his superiority in pawns on the kingside more easily. 17...Јxc5 18.¤xc5. 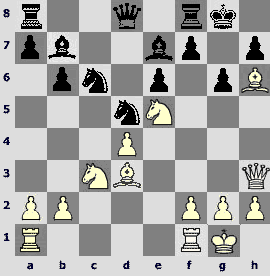 The white knight occupied the active position and Black has troubles with developing the queenside. 18...c6 19.¦d4 ¤ed7 20.¤b3 a5 21.a3 ўf8 22.f4! Soon all the pawns will stand in the fourth rank. 22...f6 23.h4 ўe7 24.g4 h6 25.ўf2. 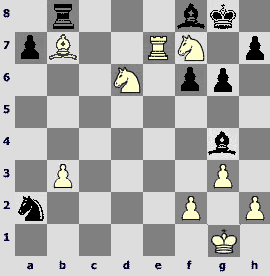 White has not decided yet what to do further, and his opponent gives a prompt here. 25...g5?! 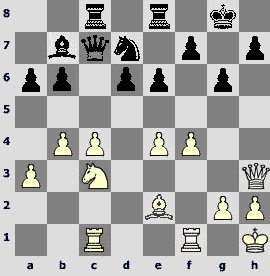 A positional concession permitting White to seize the h-file. I would risk to propose 25...a4!? and then ¦a5, though it leads to more weaknesses. 26.f5! I caught myself at the thought that I have seen the same somewhere... Of course! 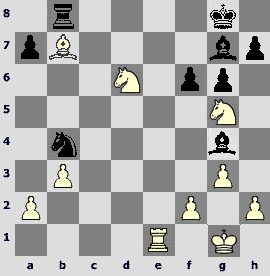 Lasker – Capablanca, Petersburg 1914. The associations grow stronger as the game goes on. 26...¤e5. Black took possession of e5, but it is nothing as compared to the overwhelming advantage in board room, potentially weak point e6 and possibility of invasion on the side file. 27.hxg5 hxg5 28.¦h1! You can think 'I would play just so too', and you would be absolutely right. However, your commentator cannot help putting exclamatory signs due to a sensation of harmony and consistency arising when looking through this game. 28...¦f8 29.¤c5 ¤bd7?! Black gradually yields his positions. There were no reasons to admit the knight to e6. Black should wait patiently. 30.¤e6! ¦f7. In case of 30...¦g8 31.¦h7+ ¤f7 White could dare 32.¤d5+!? cxd5 33.exd5 ¦a6 34.Ґxa6 bxa6 35.d6+ ўe8 36.¦c4 ¤b6 37.¦c6ќ. 31.¦h8! Black is fully pinned. 32.¤c7 threatens now. 31...¦b8 32.ўg3 b5? Black did not bear the strain. The last chance was 32...b6! with the idea 33...Ґa6. 33.b4!? White does not spoil the picture by distracting to 33.Ґxb5! cxb5 34.¤d5+ ўd6 35.¤b6+ and so on. 33...axb4 34.axb4 Ґa6 (34...Ґb7 35.¦xb8 ¤xb8 36.¤d8ќ) 35.¦xb8 ¤xb8 36.¦d8 ¤bd7. Or 36...¤ed7 37.e5! (a tribute to classic again!) 37...fxe5 38.¦h8ќ. 42.¤c5! Black inevitably loses the c6 and then all the rest. Further resistance can be explained only by the last round laws.